Last week I had the distinct honor of spending oodles of time with Margaret (Molly) Owen. She has a book coming out in just a few short months. At this point, odds are good that you’ve already heard of it. 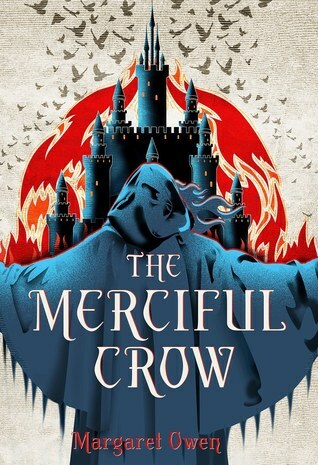 Merciful Crow has been near the top of my 2019 release list since last December, and I am so happy to have an arc to read right now. I sat down with Molly and asked her a few questions about the book, and her experiences as a debut author. Here’s a bit of what she had to say! Margaret Owen: It’s my first interview. So, very exciting. Sam Beard: That’s my first question is what has the con experience been like for you thus far as a debut author? MO: Very weird, good, wonderful, it’s been really cool in that I used to sell art at Emerald City Comic Con. And I have been talking to friends about how much I actually miss it. Because a part of it is engaging with other humans who are like, hey, this thing that you did is really cool! You don’t think about it until you’re at the con or like, I guess I did a cool thing and people want to spend money on it. And that’s a kind of validation that you don’t often get as a creative person. We get people commenting but you can sort of file that away under, oh, well, this is just someone on the internet that I don’t know telling me nice things. Your own anxiety can sort of say, that doesn’t count for anything, but when people are face to face with you, and they say, this really meant something to me, or I really, I really enjoyed this, then you’re just like, Oh, my heart. I was not programmed to feel these emotions! MO: I went last year as an attendee, I was in the middle of edits for The Merciful Crow, so I just popped in for a day or two. That was really fun, but there wasn’t a ton of buzz about the book quite yet and I could say, oh, I have a book coming out! Oh cool. When? Hmm…16 months? So this year, I’ll go and talk to people. And they’ll be like, Oh, yeah! MO: A good example; the first thing I went to go get (at ECCC) is a pin of a crow, and no less than three people sent that pin to me being like, Molly, you need to own this. This is non negotiable. So I made a beeline for that booth and I was explaining to the wonderful artist Cara McGee that it was important to me because my book was coming out and it was very on brand for the main character. So she was like, tell me more about this I think I’ve seen it, and that was when I died. Like, when I fell over. SB: I’ve been talking to everybody about this today, the impact that things like Bookstagram and book Twitter has, and how you’re able to expand your personal brand through those mean, right. What’s it been like for you? Because I feel like I see Merciful Crow everywhere. MO: It’s been wild, because I think the first thing I should note ,this is going to sound horrible, I didn’t actually follow a lot of Bookstagram. I wasn’t really involved outside of like, the writer area, of social media, and let me be absolutely clear, that’s not to like demean anything that Bookstagram does. MO: It is! Full disclosure, I’m 33, I am just at the edge of the generation that’s like, kind of on Instagram. It’s mostly pictures of our dogs. And one of the things that is important is realizing, not only is our audience on Instagram, but they take it seriously. And so this is one of my own personal soapboxes. When you write children’s media you can tell who takes it seriously and who doesn’t. And not just children’s, you know, basically media for people who aren’t adults, and you can tell the people who are like Oh Instagram…are you bookstagramming? And you’re just like, you know what, enjoy not selling your books to people who do that. It gets the word out. It’s an interesting balancing thing. Book seller’s are going to be the ones who make the decision of buying your books, which is what your publisher cares about. However, there is no denying the power of social media. So it’s like this weird combination of the stuff that publishers have to do for booksellers and the stuff that we have to do for social media to make sure we’ve got the momentum going in. MO: My approach to social media is, this is going to sound very after-school-special, but I say, always just be yourself. Because if you build a brand around something that isn’t you, you are going to have to keep that up. I would so much rather have people who, like my social media presence for what is authentic about it. MO: It’s one thing to send the word doc of The Merciful Crow to a friend who’s known me for years and then they’re like, oh, gosh, I like it it’s really good Molly. To have someone who’s receiving no money has no social obligation to me to be nice about my book is like, Oh, cool. Well, I’m feeling things I, again, was not programmed to feel! That was only about 10 minutes of audio, out of a 50 minute interview, so trust me Molly has so much more to say. I love her take on the importance of authenticity on social media, and it’s definitely something I strive for in my own life. If you haven’t already added The Merciful Crow to your TBR, go do that thing! I’m loving it so far. It’s completely unique to me in so many ways. I’ll have more from this interview as we get closer to the release date, July 30th. I’ve not heard of this one before, but it looks really good! It’s such a distinctive story, and I can’t wait to talk to more people about it. I am soooooo excited for this one! Great interview!! I can’t wait to talk to more people about it! !